Fast, Comfortable, and Pleasant Journey with us! We will do our best with the best technology and efforts. 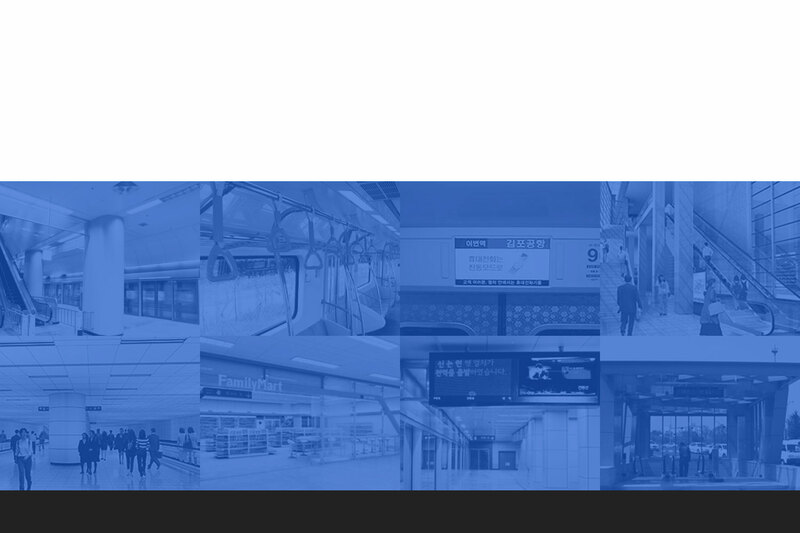 Seoul Line9 swiftly passes through the central part of Seoul from Gimpo International Airport to Gangnam. Line 9 is fast! Line 9 operates Express Train to connect Gangnam to Gimpo Int'l Airport within 30 minutes. 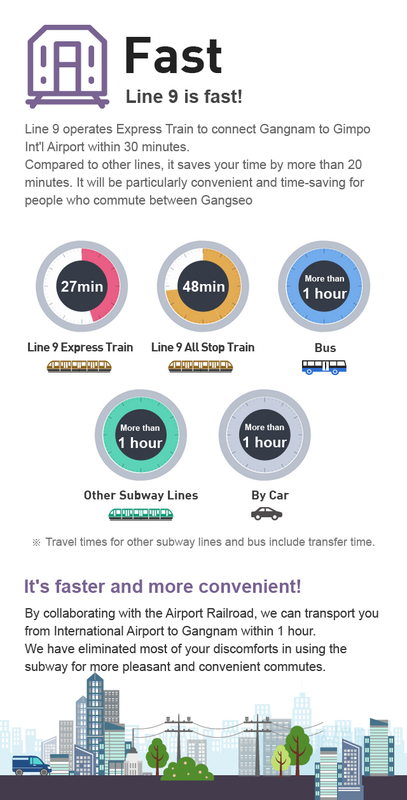 Compared to other lines, it saves your time by more than 20 minutes. It will be particularly convenient and time-saving for people who commute between Gangseo and Gangnam. 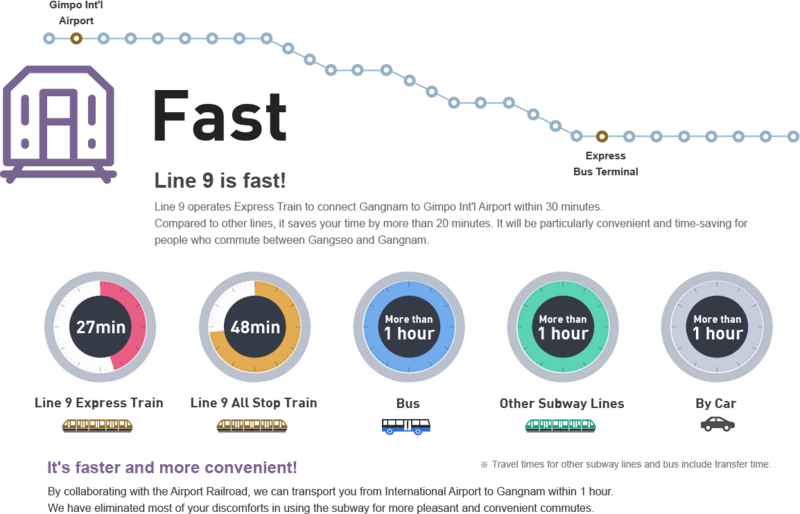 Line 9 Express Train - 27min Line 9 All Stop Train - 44min Bus - More than 1 hour Other Subway Lines - More than 1 hour By Car - More than 1 hour It's faster and more convenient! 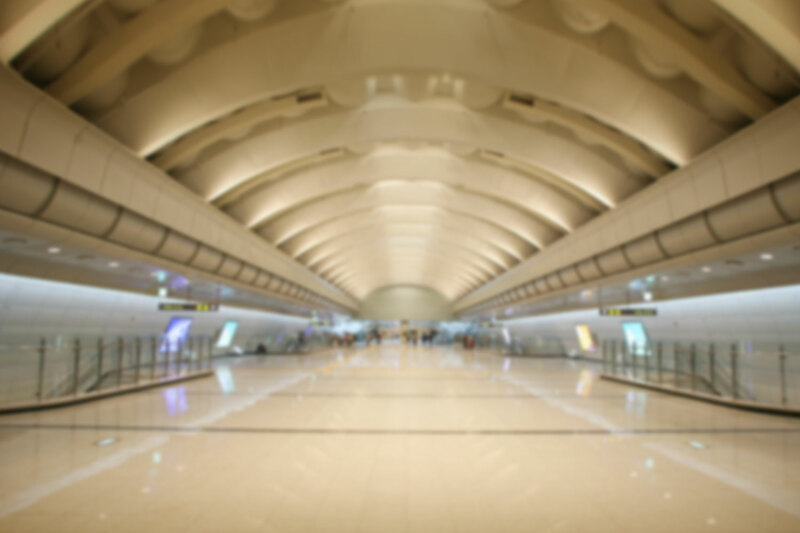 By collaborating with the Airport Railroad, we can transport you from International Airport to Gangnam within 1 hour. We have eliminated most of your discomforts in using the subway for more pleasant and convenient commutes. 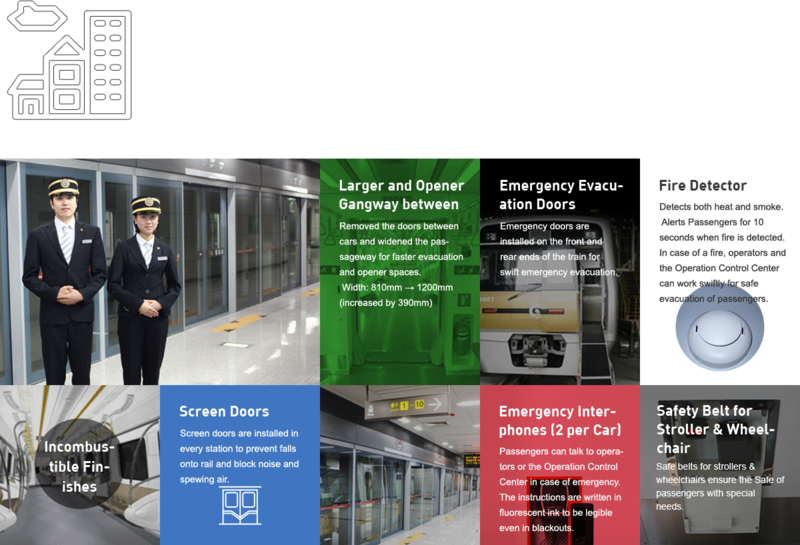 - Line 9 ensures your safety! For your safety, we have installed Screen Doors in all stations and adopted various safety features, including incombustible finishes, safely belts, open connections between cars, and emergency doors in operating rooms. Larger and Opener Gangway between - Removed the doors between cars and widened the passageway for faster evacuation and opener spaces. Width: 810mm → 1200mm (increased by 390mm) Emergency Evacuation Doors - Emergency doors are installed on the front and rear ends of the train for swift emergency evacuation. Fire Detector - Detects both heat and smoke. Alerts Passengers for 10 seconds when fire is detected. In case of a fire, operators and the Operation Control Center can work swiftly for safe evacuation of passengers. Incombustible Finishes Screen Doors - Screen doors are installed in every station to prevent falls onto rail and block noise and spewing air. Emergency Interphones (2 per Car) - Passengers can talk to operators or the Operation Control Center in case of emergency. The instructions are written in fluorescent ink to be legible even in blackouts. Safety Belt for Stroller & Wheelchair - Safe belts for strollers & wheelchairs ensure the Safe of passengers with special needs. - Line 9 is convenient! We focused on convenience to design the rolling stocks and installed elevators and escalators for easier transfers between floors and other subway lines. 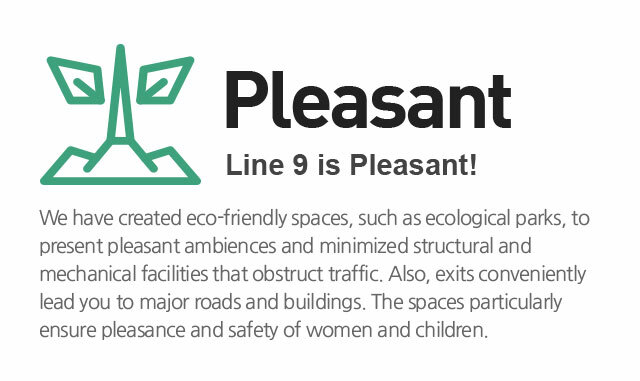 - Line 9 is Pleasant! 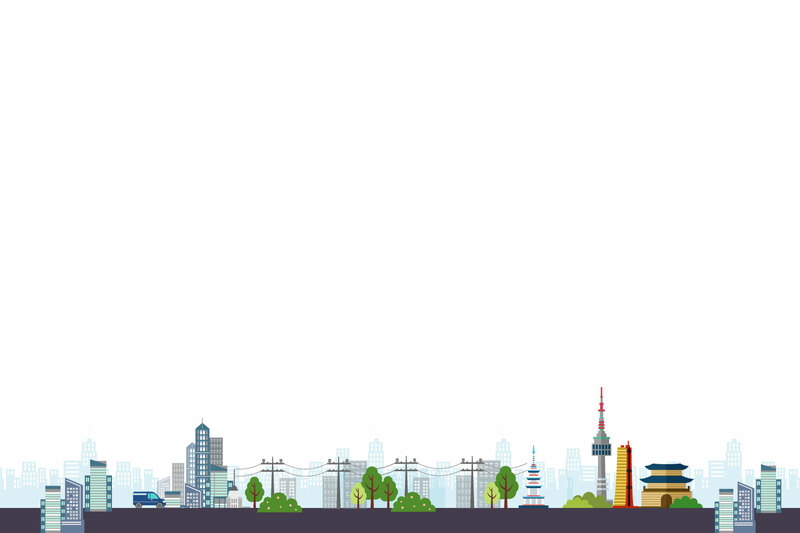 We have created eco-friendly spaces, such as ecological parks, to present pleasant ambiences and minimized structural and mechanical facilities that obstruct traffic. Also, exits conveniently lead you to major roads and buildings. The spaces particularly ensure pleasance and safety of women and children. 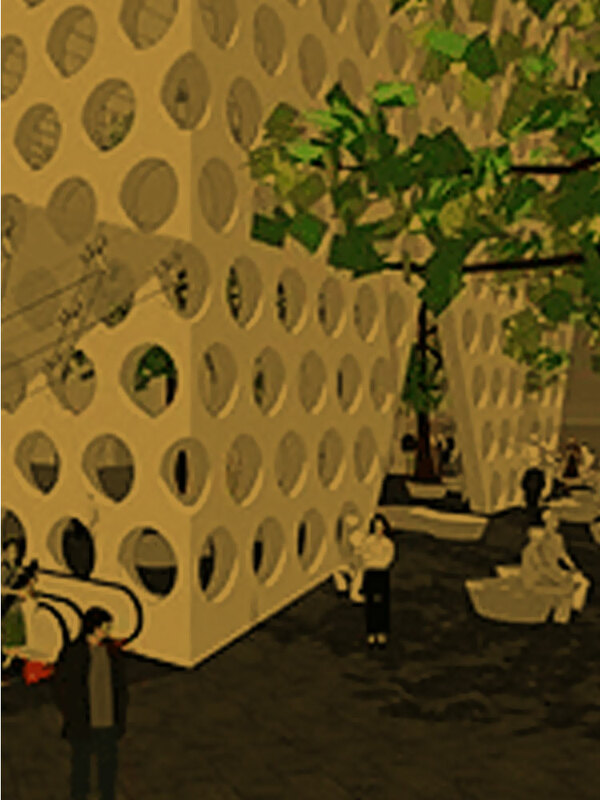 The technology to create ecologically landscaped spaces with air-purifying plants and waters has been applied to Line 9 stations for the first time to improve the quality of air in 10m or deeper underground stations and create pleasant ambiences. 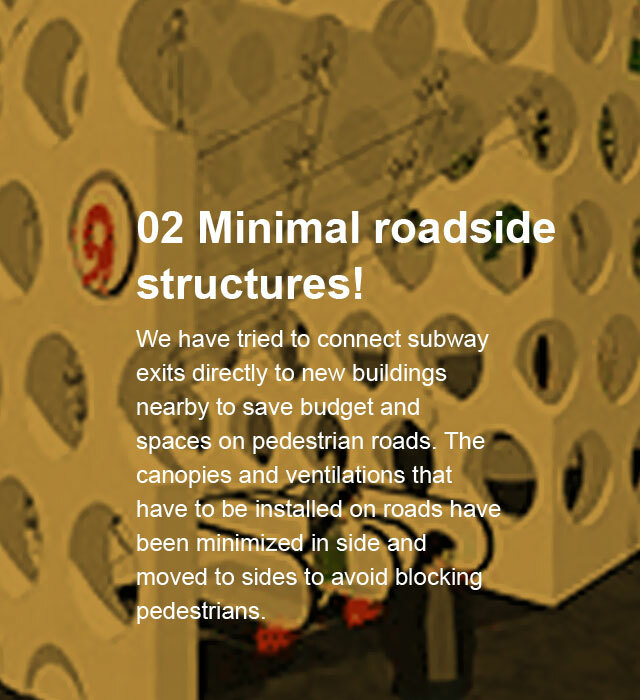 We have tried to connect subway exits directly to new buildings nearby to save budget and spaces on pedestrian roads. The canopies and ventilations that have to be installed on roads have been minimized in side and moved to sides to avoid blocking pedestrians. 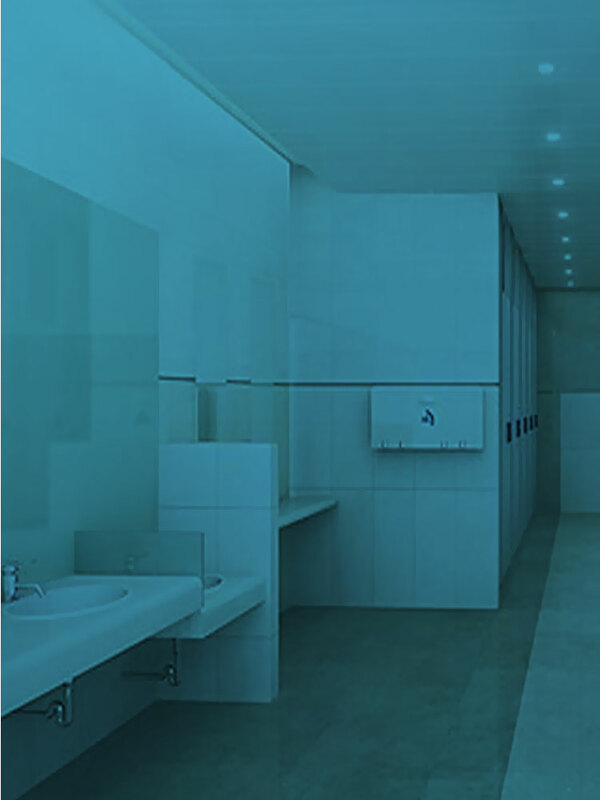 Considering that women and children have had many complaints about public restrooms, Line 9 stations adopted improved designs for restrooms especially for the pleasance and comfort of women and children. 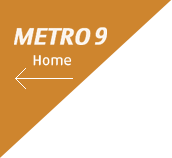 - Line 9 welcomes you! 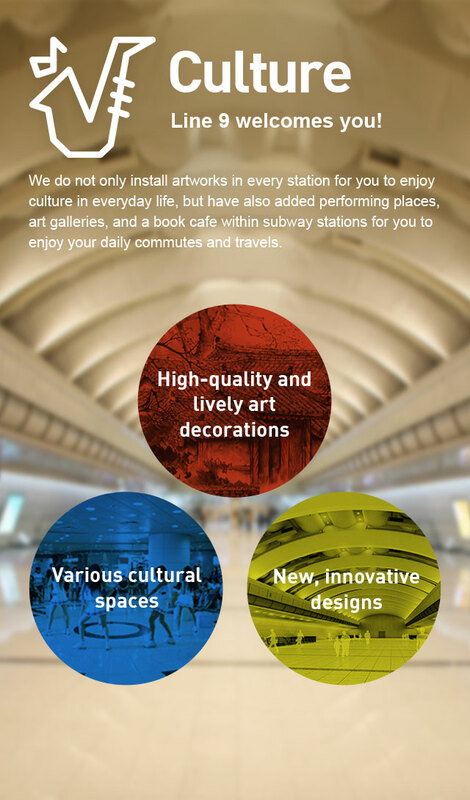 We do not only install artworks in every station for you to enjoy culture in everyday life, but have also added performing places, art galleries, and a book cafe within subway stations for you to enjoy your daily commutes and travels. 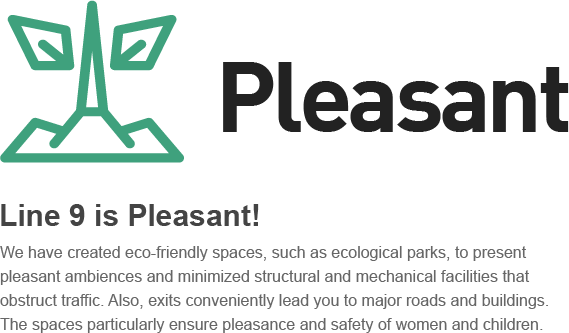 - Customers are our No.1 priority For your safety, we have installed Screen Doors in all stations and adopted various safety features, including incombustible finishes, safely belts, open connections between cars, and emergency doors in operating rooms. 01.Customer-centered operation system -Seoul Line 9 Operation Company, the operator of Seoul Metro Line 9, has built a reasonable operation system by unifying headquarter and site operations, recruiting people with hands-on skills, reduction of similar works, and improving the approval line for faster decision-making. 02. "Going for Green" Program - Seoul Line 9 Operation Company operates "Going for Green" program, a specialized customer service training program, to satisfy customer needs in various situations. 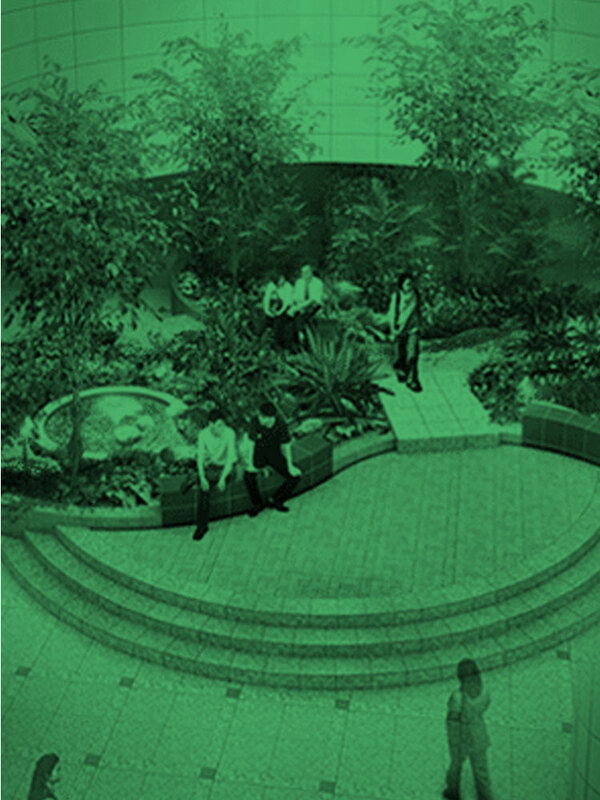 "Going for Green" program provides optimal solutions considering the physical and emotional circumstances of customers. 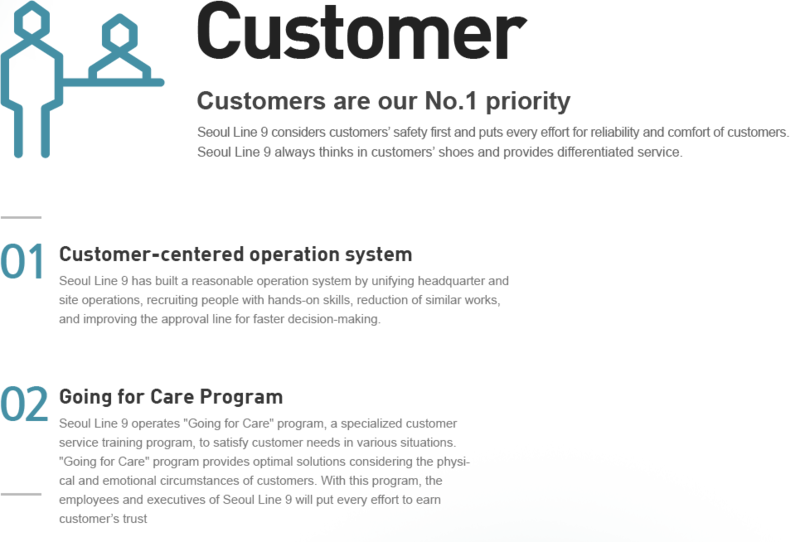 With this program, the employees and executives of Seoul Line 9 Operation Company will do our best earn customer trust. Copyright ⓒ 2015 Seoul Metro Line9 Coperation. All rights reserved. Fast subway! Comfortable subway! Pleasant subway! We will do our best with the best technology and efforts. 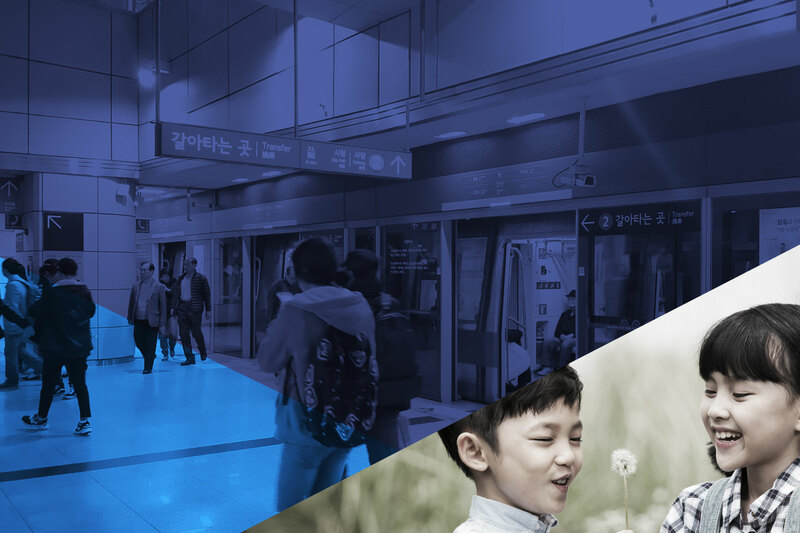 Seoul Line9 swiftly passes through the central part of Seoul from Gimpo International Airport to Gangnam. - Line 9 is convenient! We focused on convenience to design the rolling stocks and installed elevators and escalators for easier transfers between floors and other subway lines. 01 - Improved Convenience of Passengers 02 - Improved Handles for Passenger's height 03 - 19-inch LCD Monitors above Every Door 04 - All stations have escalators and elevators for easy transfer. 05 - Moving walks are installed for convenient transfer. 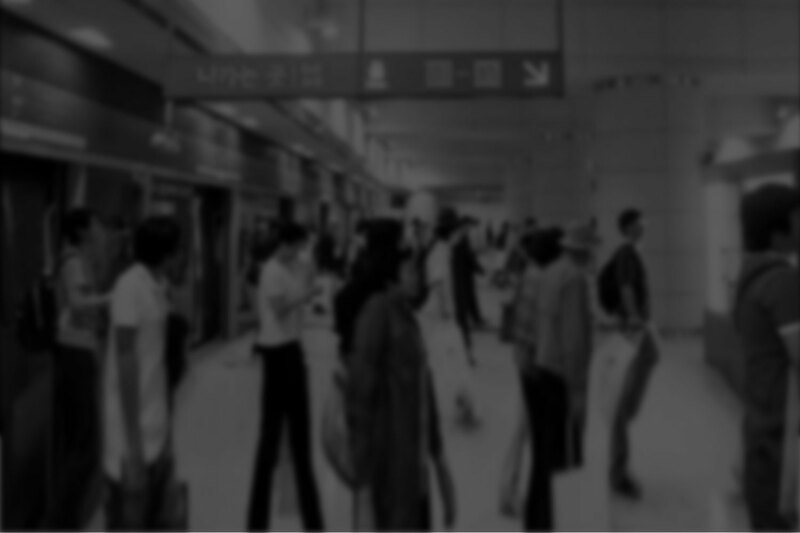 06 - Convenience stores not only for tickets, but also for daily commodities and beverages 07 - Train Destination indicators are installed in every platform, waiting room, and passageways for transfers to show real-time information on operation schedules. 08 - Train information displays on every exit indicate the exact time of the last train. Passengers do not need to run down and pay the fares only to discover that they have missed the last train anymore. 01 Eco-friendly! 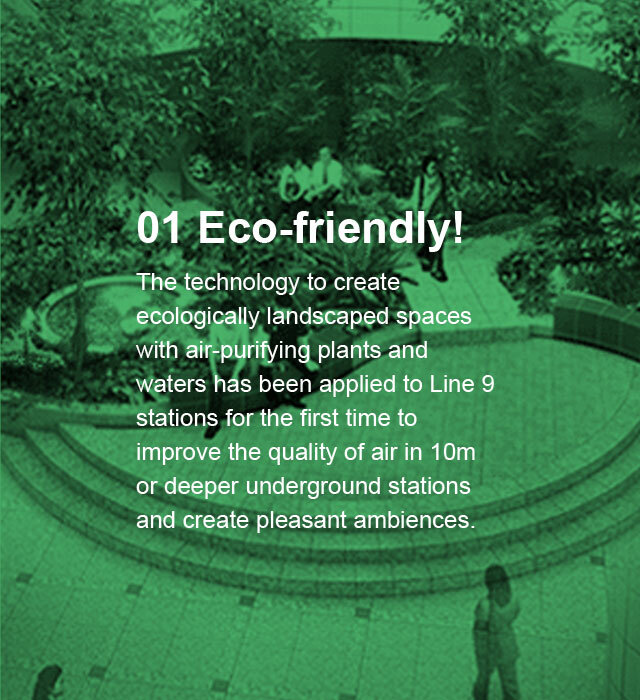 The technology to create ecologically landscaped spaces with air-purifying plants and waters has been applied to Line 9 stations for the first time to improve the quality of air in 10m or deeper underground stations and create pleasant ambiences. 02 Minimal roadside structures! We have tried to connect subway exits directly to new buildings nearby to save budget and spaces on pedestrian roads. The canopies and ventilations that have to be installed on roads have been minimized in side and moved to sides to avoid blocking pedestrians. 03 Designs for Women and Children! 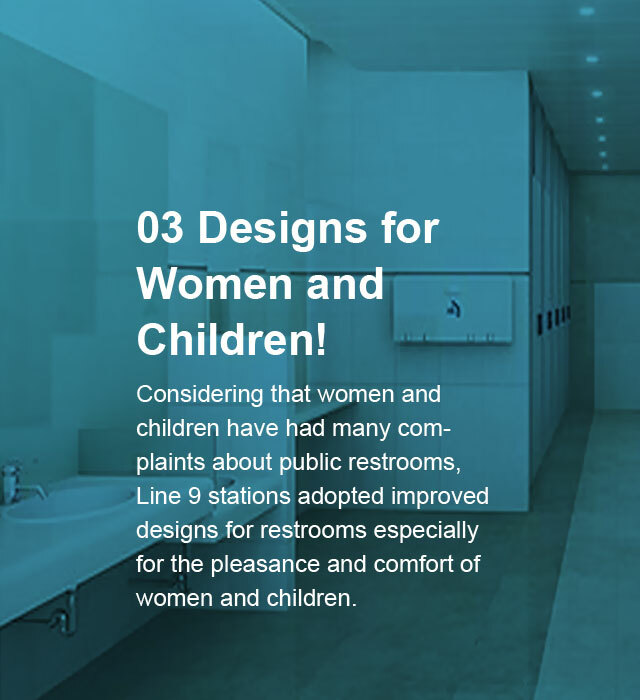 Considering that women and children have had many complaints about public restrooms, Line 9 stations adopted improved designs for restrooms especially for the pleasance and comfort of women and children.